Sometimes, in the course of conquering new lands, you annex a territory that is bat-dung crazy. We know the Soviet Union wishes it never went into the incurable chaos of Afghanistan. Now it’s time to wonder whether the Big Ten feels the same about plucking Rutgers. The latest laughingstock moment from the State University of New Jersey came Tuesday, when the school “miscommunicated” an invitation and/or subsequent un-invitation to former football player Eric LeGrand to speak at the school’s graduation. LeGrand, whose perseverance has been a nationwide inspiration after being paralyzed in a Rutgers game in 2010, says he was asked by a Rutgers administrator to give the commencement address. He enthusiastically said yes. Then LeGrand says he was told by athletic director Julie Hermann that the offer was being rescinded so former Gov. Tom Kean could speak. He was hurt and said so publicly. And when Rutgers wound up as a national piñata for roughly the sixth time in the last 14 months, it abruptly and apologetically un-miscommunicated with LeGrand. Rutgers president Robert Barchi called the school’s greatest ambassador and said, of course, we’d love for you to still speak. The young man had the grace to accept the apology and will deliver his speech May 18. The good news is that LeGrand will get to speak, and the students will get to hear him, and that should be an uplifting thing for all involved. The bad news is that at the very time the Big Ten is ramping up its East Coast presence, the conference’s new gateway school to New York City cannot stop bringing disrepute upon itself. “Jersey Shore” wasn’t as much of a serial embarrassment to the state as Rutgers athletics has been. From the abusive basketball coach (fired) to the scapegoat athletic director (fired) to the amnesiac and tone-deaf replacement athletic director (not fired yet, somehow) to the new basketball coach without a degree from the very school that hired him (working on it) to disrespecting a classy guy in a wheelchair, Rutgers is on a roll of prodigious incompetence. 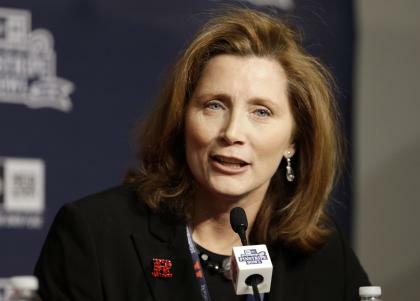 That roll has not timed well with the Scarlet Knights’ golden parachute out of the marginalized American Athletic Conference into the prestigious and lucrative Big Ten. The timing reached a nadir this week, with commissioner Jim Delany jetting around the Eastern Seaboard to announce new deals designed to turn the Big Ten into America’s first national conference. Delany was in New York on Monday to announce a new season-opening basketball series with the Big East. It’s an idea that will be good for a sport that is trying to make fans notice it during the heat of football season. And it will be good for the Big Ten because it further establishes the league’s presence and exposure in the Northeast. The fact that the conference also is opening an office in Manhattan and putting three full-time staffers there only reinforces how important the Big Ten sees establishing a beachhead in the nation’s media center. On Tuesday, Delany was in Washington, D.C., to announce that the 2017 Big Ten basketball tournament will be played there. That’s a huge geographic leap east from the traditional anchor sites of Indianapolis and Chicago, but with Maryland joining Rutgers in the league this year, the nation’s capital is another important frontier to settle. The Big Ten will set up office space in D.C. as well, though at present there will be no full-time staff there. Thus Delany is a digital-age John the Baptist, spreading the good news about the Big Ten Network across the land. And hoping cable subscriptions follow. “The goal is to get consumers to quit thinking of them as a Midwest, Chicago-based brand,” said Michael Smith, who covers college sports for Sports Business Journal. “The brand stands for a cable channel, and they’re trying to establish that in new markets. The Northeast is clearly the Now Market for college courting expanded consumer bases. The Pac-12 started the flirtation with that area of the country, sending all its football coaches to New York and then ESPN in Connecticut in 2011 for a summer media blitz that has become an annual event. But the Atlantic Coast Conference and Big Ten were the ones positioned to really capitalize by acquiring schools to serve as TV inventory: Syracuse and Pittsburgh to the ACC; Rutgers and Maryland to the Big Ten. In March, the ACC announced that it will move its tradition-laden conference basketball tournament to Brooklyn in 2017. Now the Big Ten is heading to D.C. the same year. You can wonder how that will play with Midwesterners who bristle at being dismissed as Fly-Over Country, but their feelings are pretty much immaterial. For the media entity known as the Big Ten and its network, Rutgers is a key acquisition. Not because the school brings anything to the table in terms of athletic prowess -- the Scarlet Knights have won zero American Athletic Conference championships in any sport this school year, and rarely come close – but because of its location in a highly populated media market. “Rutgers is just an avenue to get people to think about your brand differently,” Smith said. It would help the brand – if we’re going to call it that – for Rutgers to cease the regular eruptions of dysfunction. Either eliminate the bozo behavior from the alleged leaders of the institution, or eliminate the bozos themselves and start over. Emperor Delany has to already be tiring of the brush fires on his chaotic Northeast frontier.